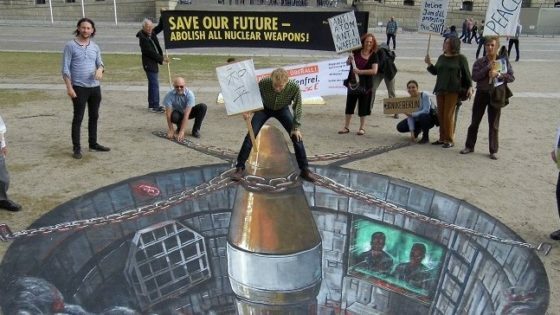 Those involved in Chain Reaction 2016 will have no trouble agreeing that its campaigning time has passed in the twinkling of an eye, most certainly shaking up an incredible number of cities with creative nonviolent events and actions to protest nuclear weapons activities and to celebrate nuclear disarmament initiatives. Ground Zero Center for Nonviolent Action was a distinguished co-sponsor of Chain Reaction organising a variety of activities in the nearby area of Bangor, Washington, home of the largest concentration of deployed nuclear weapons in the United States. Celebrations started with their very own Annual Peace Fleet demonstration being joined by the historic peace boat the Golden Rule, known for its omnipresence on Northwest Pacific sailing routs, spreading the Veterans for Peace stand against war and nuclear weapons. The Hiroshima and Nagasaki weekend stood for a height in Chain Reaction 2016 events, and Ground Zero certainly embraced these commemorations. On Sunday, August 7, a Eucharist took place at the Main Gate of the Bangor Trident base reminding us of the sanctity of human lives in face of the threat that nuclear weapons pose us. Participants later went to Kitsap Mall to distribute educational leaflets to raise awareness of the Bangor Trident base. 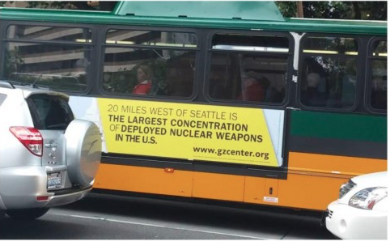 A banner designed and sponsored by the organisation was also going around town via Seattle Metro Transit buses where it could be read “20 MILES WEST OF SEATTLE IS THE LARGEST CONCENTRATION OF DEPLOYED NUCLEAR WEAPONS IN THE U.S.”. For the anniversary of the Nagasaki atomic bombing, on August 9, a water-based nonviolent protest and witness for peace was staged in the Hood Canal at the Bangor Base – namely “Boats by Bangor”. The Golden Rule led the flotilla. This non-violent demonstration, in collaboration with Veterans for Peace and the annual Pacific Northwest Interfaith Peace Walk, was crucial to highlight the presence of Trident submarines loaded with Trident D-5 missiles and nuclear warheads in the Bangor Trident base. The fact that Ground Zero staged such event in the Hood Canal is extremely significant for the area is held under strong control by the US Navy secured by federally established security zones enforced by their personnel. Nevertheless, the flotilla from Ground Zero was treated in a professional manner by the security stronghold. “Chain Reaction 2016 gave Ground Zero Center for Nonviolent Action a unique opportunity to act in solidarity with so many others around the world in common cause. 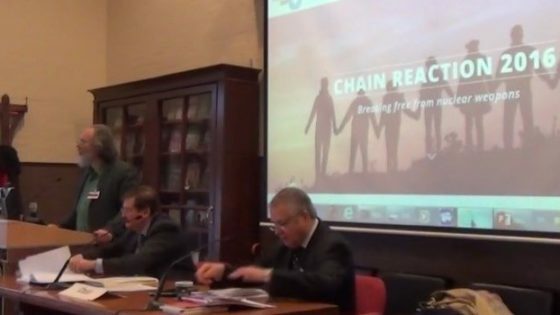 All of that positive energy was such a boost to our spirits, and has provided the impetus to magnify our efforts in the year ahead.”, says Leonard Eiger, Media and Outreach Coordinator of Ground Zero, when asked what it meant for his organization to be taking part on Chain Reaction 2016. Chain Reaction 2016 has ended on October 2, International Day for Nonviolence (Mahatma Gandhi’s birthday).